This month’s recipe is warming, delicious and nutritious! Peel and chop sweet potatoes and set aside. Chop broccoli, carrots, onions and garlic. 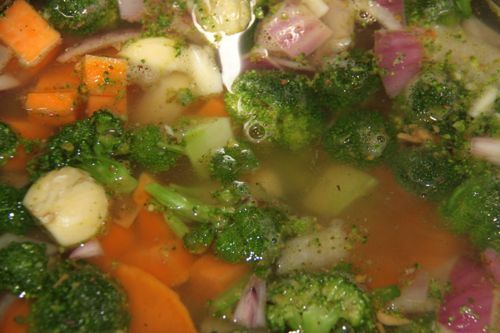 Heat some olive oil in a stock pot and gently cook the raw vegetables until the onions are softened. Add the 8 cups of vegetable broth, sweet potatoes, and turmeric. Boil until everything is soft (about 45 minutes). Blend to desired consistency with a hand blender, or transfer to a high powered blender such as a Blentech or a Vitamix. Season to taste with salt and pepper. If you like a bit of spice to your soup add about 1 tsp of chili powder.